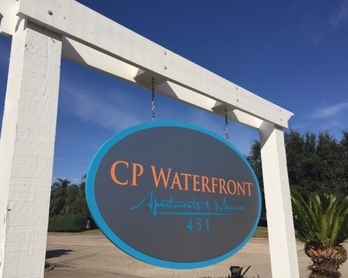 Located on a quiet marina channel just minutes from the shores of Clear Lake, CP Waterfront offers the finest apartment living experience in all of League City. These pet-friendly one, two and three bedroom apartments provide the perfect blend of upgraded features, convenient amenities and an unbeatable location. A serene lifestyle awaits you in one of these spacious, customized floor plans designed with sophisticated details. Each home features beautiful hardwood flooring and an elegant stone fireplace. Look forward to cooking your favorite meals in an upgraded kitchen with stainless steel appliances and striking white wood cabinets. Take it easy in a comfortable bedroom with plush carpeting and ample closet space. Evert apartment also comes with an expansive patio and washer and dryer connections with appliances available through the community. Leisure and entertainment are never difficult to find with an array of amenities available right outside your front door. Lounge by the waterfront swimming pool shaded by large palm trees. Host guests for a summer barbecue with gas grilling stations along the dockside. Build your strength at the fitness center equipped with cardio machines and free weights. 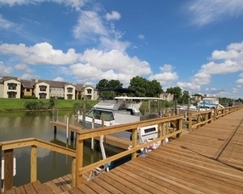 Take a stroll down to the marina where you can dock your boat in your own thirty, forty or fifty-foot slip. Other amenities and services include laundry facilities, on-site maintenance and online rent payments. Located just off Marina Bay Drive, residents are always a short distance away from premier shops, restaurants and entertainment. Seize the chance to lease a one, two or three bedroom apartment at CP Waterfront.